The pineal region, located deep within the brain and cranial vault, is surrounded by important neurovascular structures. Although primary disorders of pineal gland endocrine function are nearly unheard of, the region is host to a wide variety of tumors. Neuroendoscopic keyhole approaches to the pineal region are effective and safe methods to address a variety of these pathologies. Anterior approaches are primarily used for tissue biopsy and for cerebrospinal fluid diversion for lesions that obstruct the cerebral aqueduct or third ventricle. Should the anatomical configuration of the lesion permit, posterior supracerebellar-infratentorial approaches can be used to resect lesions. Compared to traditional open microscopic approaches, these approaches have improved illumination and magnification of the pineal region. 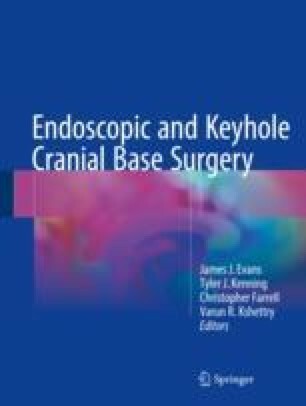 Endoscopic keyhole approaches are associated with a steep learning curve, and they require a team-based approach as well as an intimate understanding of the important neurovascular structures of the pineal region.